Another yard here and a couple of inches there and the Bryant Blue Hornets eighth-grade team of Bethel Middle School might’ve been in a position late to rally past the Cabot South Panthers eighth grade team on Thursday night. Trailing 13-2, the Hornets drove to the Panthers’ 15 with time for one more play in the first half. Quarterback Carson Burnett completed a pass to Michael Rivera but the Panthers tackled him at the 1 as time ran out. So, instead of 13-9 or 13-10, the 13-2 score held at the break. At 13-10, even with Cabot South’s touchdown drive to start the second half, the Hornets were on their way to answering when a swing pass from Burnett intended for running Fabian Torres that might’ve broken big, was just barely tipped by Cabot South’s Jose Lopez. He was able to catch the deflection and rumble 71 yards for a clinching score. One more yard on the throw to Rivera and two more inches higher on the throw intended for Torres and it might’ve been 21-18. Unfortunately, those close calls went the Panthers’ way and the result was a 27-10 victory. The Hornets scored in the final minute on a 47-yard touchdown run by Torres as Cabot South was working in reserves. He also ran in a two-point conversion to set the final score. Bryant Blue had something going to start the game too. Torres had runs of 20 and 10 yards as the Hornets drove to the Cabot South 29. But two of the next three plays lost yardage. A fourth-down pass fell incomplete and the threat was thwarted. Using its traditional power running game, particularly fullback Eric Masterson and nifty quarterback Braden Jay, the Panthers drove 62 yards in eight plays to take the lead. Masterson started the march with a 16-yard burst. Jay finished it on a 7-yard keeper. After Bethel was forced to punt (and their kick was a short one), the Panthers scored again with Jay keeping for a 28-yard touchdown. He ran in the two-point conversion as well to make it 13-0 with just 3:05 left in the half. 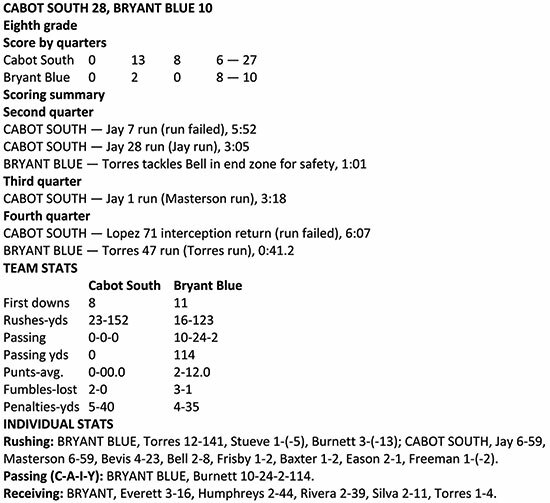 Bryant responded with another good drive sparked by Torres’ 37-yard gallop and a 16-yard completion from Burnett to Blake Everett. Torres powered to the 4 but on the next play, Burnett’s pass into the end zone was intercepted by Cabot South’s Mason Bell. Surprisingly, Bell tried to return it from the back of the end zone instead of downing it for a touchback. Torres tackled him before he could get back to the goal line and the result was a safety, making it 13-2. Cabot South had to kick it back to Bryant Blue as well. With the free kick returned by Kenjata Daniels, the Hornets had a shot at scoring again with a first-down at the 50 and :58.3 showing on the clock. The drive started with a 19-yard completion from Burnett to Rivera. From the Panthers’ 30, Burnett’s deep pass down the left sideline was intercepted. A flag was thrown and the Panthers’ safety who made the pick just stopped and handed the ball to the official who took the live ball and whistled the play dead despite the fact that the interception return should’ve been on-going. Of course, everyone knew a pass interference penalty had been called but, if the return had continued, it might’ve been fumbled and recovered by the Hornets or scooped up and returned for a score — circumstances in which Bethel coach Josh Akers might’ve declined the interference penalty. Anyway, the penalty gave the Hornets one more chance, resulting in Burnett’s pass to Rivera from the 15. Cabot South’s Landenn Sitzmann tackled him at the 1 to end the half. The Hornets tried an onside kick to start the second half but the Panthers recovered and promptly drove for another score. Jay capped the drive with a 1-yard sneak. Masterson ran in the conversion to make it 21-2. Bryant Blue’s answering drive started at the 28. Burnett’s 33-yard throw to Alec Humphreys put them in scoring position. The Hornets eventually reached the Cabot South 20 when Lopez intercepted the swing pass and scored. The Hornets’ late touchdown came after an exchange of punts. The kick by Bryant Blue’s Brandon Jones hit and bounced around. A Cabot South player touched it, making it a live ball. Bethel pounced on the ball and, two plays later, Torres broke the TD jaunt. The Hornets, now 3-4 on the season, will close out their 2017 campaign at Benton on Halloween night.